The Klipsch Synergy C-10 center channel speaker is designed to provide accurate film dialogue and sound-effects for music and film-lovers. It is the perfect match for any Synergy Series Home Theater system or any Home Theater system where big things are required from a small package. With over 60 years of legendary performance and design expertise in Home Audio, Home Theater and Professional Cinema, Klipsch knows how to deliver the goods in the form of truly premium sound. 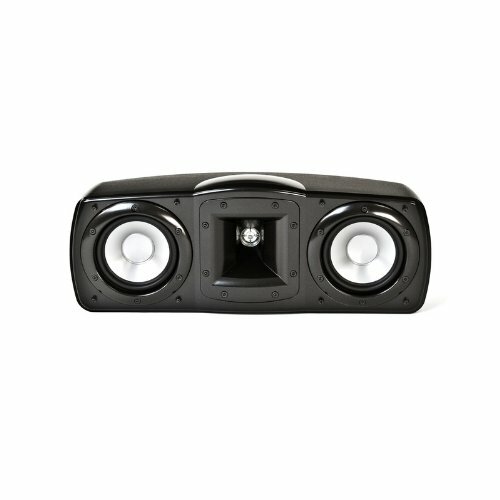 The C-10 is loaded with technology including heavy-duty dual 4-inch IMG woofers and a 3/4-inch aluminum diaphragm compression driver utilizing the exclusive 90°x60° square Tractrix Horn, all which provide the superior clarity and dynamics Klipsch premium speakers have long been heralded for. This new Synergy series product also boasts improved performance throughout the listening room and an even bigger soundstage, thanks to such acoustic updates such as an entirely redesigned tweeter and crossover. The new High Gloss black accents and elegant Black Ash vinyl finish make a handsome enclosure for all this technology and firepower. Includes Down-tilt foot to optimize angle of center channel speaker.